Article taken from Good Old Boat magazine: Volume 3, Number 1, January/February 2000. You're all settled in for the night in that well-protected cove, when the wind picks up. What had been a nice quiet anchorage is now alive with motion as the wind causes the boats to weave back and forth on their anchor rodes. Your boat rolls and jerks from one "tack" to another, and you begin to worry about what all this motion is doing to the set of your anchor. Your nice quiet evening is now anything but restful. Most people call this weaving back and forth "sailing at anchor." But my favorite nickname for the activity is "horsing around" because the image it creates is so descriptive of the motion. And while the name may sound like fun, the motion it describes can lead to real problems. What causes this phenomenon? For most boats, the center of effort (or windage) of the topsides and rigging is well forward of the underwater center of lateral resistance. This means the boat is out of balance while on the hook, and doesn't really want to weathercock. Whenever the boat drifts backward during a gust (or there is a slight change in the wind direction) the bow will fall off faster than the stern, putting the boat broadside to the wind. Once that happens, the bow continues to fall off, and the boat will "sail" away in the new direction, up to as much as 30 to 40 degrees off the wind, until brought up short by the rode. Detail of riding sail above. It seems as if the boat should eventually settle down, given a steady wind. But in reality, the wind is never steady in either direction or strength for very long. During the lulls, the boat is drawn forward by the weight of the rode (creating slack), only to fall back and turn broadside during the gusts. Why all the concern? Well, at the very least, all this weaving back and forth can make things uncomfortable down below. More importantly, it is quite possible for two boats anchored side by side to get "out of phase" while sailing at anchor and actually collide. We witnessed this a few seasons ago while anchored in Bear Drop Harbor in the North Channel on a day with gusty 25-to-30-knot winds. Two nearby anchored boats began to sheer, on opposite tacks, and exactly out of phase. The boats kept getting closer and closer with each tack as the skippers looked on helplessly. A collision was avoided only when one skipper broke the cycle by letting out more rode. By far the biggest concern of "horsing around" is the effect it has on the set of your anchor. The shock loads on the rode from coming up short on opposite tacks are practically at right angles to each other, and all this stress can eventually break the anchor free. Even if the anchor holds, the sideways motion at the bow can chafe right through a nylon rode in a few hours. So, if you want to sleep better at anchor, you need to do all you can to reduce this sailing at anchor. But what can you do? While we've never tried it, a couple of skippers we have met swear by anchoring stern-to. This places the center of effort behind the center of resistance, and keeps the boat steady. (It also looks really weird.) The downside is that some boats are not very seaworthy stern-to, and most companionways are not designed to be very weatherproof from the stern. So I would worry about being caught in a storm anchored backward, but in fair weather it seems to work quite well. Just what is a riding sail? It's essentially a small and heavily built mizzen, rigged on the backstay, and sheeted forward. The added windage of the sail brings the overall center of effort well aft of the center of lateral resistance. Now when the boat drifts backward during a gust and the bow begins to fall off to one side, the effort of the wind on the riding sail quickly pushes the stern in and brings the boat back head to wind. A riding sail should be constructed board-flat, of heavy (4- to 8-ounce) cloth, with a hollow foot and leech to reduce flutter, and a straight luff with hanks for attaching to the backstay. 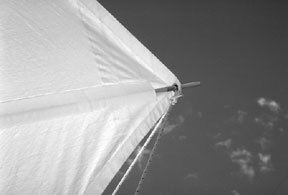 Adding full-length battens to the sail is also a good idea to reduce slatting in high winds. As for size, a good rule of thumb is to have the sail made about the same size as a storm jib, or from 5 percent to 10 percent of the total sail area. 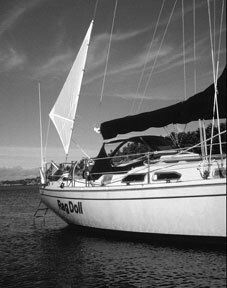 In fact, you can use a storm jib on the backstay as your riding sail. And for that matter, ketches and yawls can achieve the same effect by just leaving their mizzen up (perhaps with a reef or two). But since whatever you use will be left up constantly while at anchor and exposed to a lot of ultraviolet radiation, it's a good idea to have a dedicated riding sail, and not subject your storm jib or mizzen sail to all that abuse. How do you rig a riding sail? First, attach a pendant between the stern of the boat (the top stern rail works well) and the tack of the sail, long enough to keep the sail well clear over the cockpit. Then attach a halyard to the head and hoist the sail aloft. Finally, rig a sheet from the clew to a place on deck amidships, or - better, but more work - run a sheet to each side of the deck or cabin house. You can leave the sail flying free like this, but it will tend to slat a bit in high winds. So it's best to attach the luff of the sail to the backstay with a number of hanks. Riding sails may not be common, but any sail loft can make one up for you. Or you can contact Sailrite, which markets a basic anchor riding sail kit with a 75-inch leech, a 58-inch luff, and a 72-inch foot (15 square feet) designed for boats over 20 feet. It costs between $68 and $73, depending upon the size of the snaps needed to fit your backstay. This kit was just upgraded to use Top Gun sailcloth, rather than Dacron. This makes the sail hold up much longer. Our riding sail came from Kent Sails, in Mount Clemens, Mich., and is 150 inches on the luff, 124 inches on the leech, and 62 inches on the foot (26 square feet) with seven hanks along the luff. Kent Sails designed our current riding sail with a fiberglass rod running between the backstay at the luff and the grommet at the clew. This rod does a nice job of stiffening the sail, and keeps it quiet in high winds. But more than that, this unusual design has the interesting feature of holding the clew out away from the backstay, in much the same way a wishbone boom on a sailboard holds the clew of the sail out from the mast. With the clew held out taut, you can swing the sail around on the backstay to point aft, which not only gets it out of the way of the cockpit, but has the advantage of putting the sail's center of effort even farther from the bow, making it even more effective at keeping the boat steady. If you already have a riding sail with hanks on the luff and would like to try this arrangement, it's a simple matter to modify the sail to be able to point aft. All it takes is a few feet of hollow aluminum rod, a short piece of webbing, and a couple of sheet metal screws. First lay out a line between the luff and the clew, perpendicular to the luff, and mark where the line meets the luff. Then buy a length of hollow aluminum rod that is at least 6 inches longer than this line, and slightly smaller in outside diameter than the clew grommet (so the rod will slide through the grommet). Using your sail repair kit (you do have one aboard, don't you?) sew about 4 inches of 1-inch webbing to the side of the luff at the position you marked, with enough slack to hold the rod. (The purpose of the webbing is to keep the rod in position on the backstay.) Then cut about a half-inch-deep slot into one end of the rod so the end fits over the backstay. The final step needs to be done with the sail hanked onto the backstay and hoisted taut. Slide the slotted end of the rod through the clew grommet, through the luff web loop, and over the backstay. Then pull the clew out taut, and mark the point on the rod where it enters the clew grommet. Remove the rod and mount a couple of sheet metal screws at that point on the rod, which will keep the clew from sliding down the rod toward the backstay. Next, cut the excess rod off about 4 inches beyond the screws. When you now place the slotted end of the rod through the web strap, then the other end through the grommet up to the screws, and finally slide the slot over the backstay, the clew should be held out nice and taut. Finally, just rotate the whole sail aft, and add a sheet from the end of the rod to each corner of the stern rail. 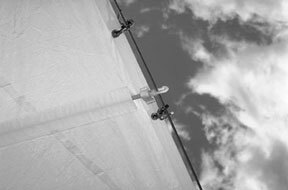 Using rolling hitches for each sheet makes it easy to adjust the centering of the sail. And that's it - you're done. 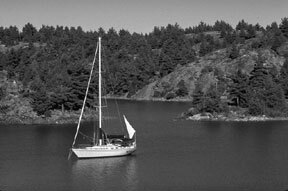 A nice side effect of any riding sail is that it makes your boat easier to find in a crowded anchorage, as there aren't too many boats out there with big white triangles at their sterns. (This has come in very handy when returning by dinghy from a late evening ashore and trying to find our boat by flashlight.) Our unusual aft-pointing rig is also very sociable, in that we usually have at least one sailor in each anchorage stop by to ask about it. Last summer we even had the skipper of a nearby Alberg 30 so intrigued that he spent an hour trying to construct a similar rig using his storm jib and a telescoping awning pole. At one point when things weren't going too well and the pole fell to deck for the second or third time (there was no webbing at the luff to hold the pole in place) he good-naturedly called over, "Look what you started!" Whether you choose the traditional forward-sheeted arrangement, or the unusual aft-pointing rig, I highly recommend you consider using a riding sail to steady your boat at anchor. Leave the "horsing around" for on shore. Steve Christensen and his wife, Beth, sail their Ericson 38, Rag Doll, out of Saginaw Bay on Lake Huron and spend each August cruising the North Channel . . . with their riding sail.